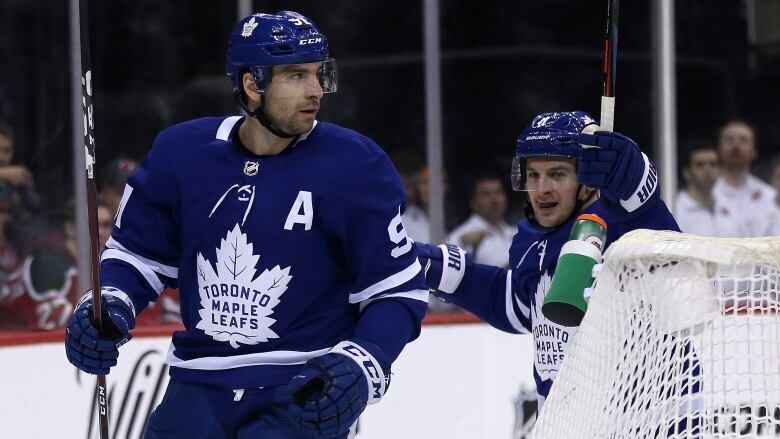 John Tavares scored twice and hit the 300-goal mark for his career in leading the Toronto Maple Leafs to a 4-2 victory over the New Jersey Devils on Thursday night. John Tavares is earning every penny of the seven-year, $77 million US contract the Toronto Maple Leafs gave him in the off-season. Not only is he living up to the hype, the 28-year-old centre is having a career year. Defenceman Ron Hainsey also scored in Toronto's three-goal first period and third-string goaltender Michael Hutchinson made 27 saves as the Maple Leafs beat the Devils for the third time in as many games. Hainsey scored his first goal since Nov. 23 with a shot from the left point at 4:30. Tavares got his 300th goal less than three minutes later, lifting the rebound of Jake Gardiner's shot past Kinkaid. He would add No. 301 in the waning seconds of the period, finishing off a great play on which Mitch Marner made a cross-ice pass to Morgan Rielly and the defenceman found Tavares with another cross-ice pass for a shot into an open net.